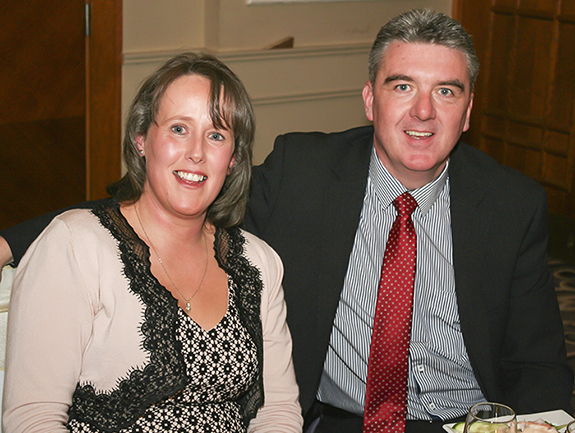 THE Club held its ANNUAL AWARDS’ FUNCTION on the 21st of February in the Castlecourt Hotel. The presentation of various awards for excellence achieved during the past year is the highlight of the Club’s Calendar. As this function also brought the 125th Anniversary of the Club to a conclusion it was befitting that a presentation to the County Champions 1986, 1993 and the Connacht Champions in 2002 was incorporated into the night. Kilmeena GAA were honoured to have the company of Mr Mike Connelly, Chairman of Mayo County Board and Mr. Pat Holmes, Mayo Senior Joint Team Manager to enhance the occasion. 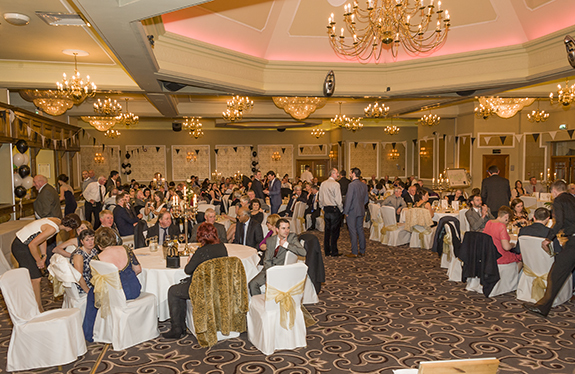 A packed Dome Suite was indicative of the anticipation which this social occasion had engendered and the large attendance, where young and old mingled, were not disappointed. The presence of our senior supporters, among them some octogenarians, added a connection from the past and made it all the more special. The Function Room was bedecked in Black and White, festooned with bunting, balloons and Club flag. The Kilmeena GAA Club were delighted to display the 125th Anniversary Logo Banner which was created by 6th class pupil Jaimee Geraghty who attended St Brendan’s NS Myna. The Underage Trophies were displayed with great pride alongside the “Mayo Club Sports Grounds” of the Year Award. The Chairman, Mr. Willie Keaveney, extended a warm welcome to all in attendance. He did not omit the Kilmeena Diaspora in other countries and acknowledged their contribution to the Club throughout their years. The first order of business was the presentation of specially commissioned Mayo Crystal Trophies to the County Junior Champions of 1986 and 1993, and the Connaught Champions and All-Ireland Runners-Up from 2002 by Pat Holmes. Pat, in his address, outlined the high standards, involving levels of preparation previously engaged in by county teams, that is now required by club teams in order to achieve success. This humble former Moygownagh Club and Mayo Senior footballer outlined his aspirations for the County Team and included the realism of the “variables” that can determine the outcome of a championship match. Here’s hoping Pat, that you will be the manager to be hailed in Red and Green Glory on that third Sunday in September this year. The inimitable Mr. Tom Ryan was charged with the task of introducing each player and the respective Team Managers and Selectors. While Tom kept proceedings moving smoothly, he also regaled humorous incidents with various players and his light hearted spontaneity with commentary ensured that boredom was not an issue. It was also a night of nostalgia for Tom, because he had played football with some of the “Lads” and along with Mr Willie Kelly had coached at U14 winning two County Titles in 1993 and 2004. So, some of the now “Mature” 1993 team became the Connacht Junior Champions in 2002. Martin McIntyre’s empathy with the Club and Community was transmitted through his screening of old video footage evoking numerous memories. His determination to create an ambience of warmth was evident in his collection of “Welcome” photographs to the stalwarts of the 1940’s, 1950’s, 1960’s and his photographic profile of each player, selector and manager for presentation. The highlight of the presentation was undoubtably the presence of Mr Michael Kirk, joint manager with George Golden in 1993. Michael traveled from Cork and the extended applause and cheers which greeted him endorsed the Club’s gratitude to him for his work with the 1993 team some twenty two years ago. Appreciation also to former club stalwart Joe Duffy, for making the long journey from County Clare, where he now resides, to be with us on the night. Next up was the presentation of the Club Awards, presented by Mike Connelly. Mike praised the Club for all they have achieved in the past year, highlighting the Underage success, the winning of the Club Grounds of the Year Award, and the publication of the Club Five Year Plan. He thanked the Club for its support of the County Board. He thanked Kevin Barrett, County Board Rep and incoming West board Chairperson, Willie Kelly, Development Officer, Michael Gavin and Padraig Walsh for their work with County Development Panels. He wished the Junior Team and the new Management Team the best of luck. Community Award: Kilmeena and Fahy Foroige Clubs. Majella McGonagle ,a club leader, accepted this award. Most improved Player: Stephen Staunton. Young Player of the year: Niall Feehan. Senior Player of the Year: David Stenson. Club Man of the Year: This well-deserved accolade went to Neil O’Donnell. Rory Smythe (Mid West Furniture Sponsors) was on hand to make the presentation. Thank you to the Smythe Family for your generous sponsorship. A presentation was made to the Members of the 125 Committee – Pauline Goggins, Anne Moore, Claire Ryan, Martin McIntyre, Colm Barrett, Ollie Mulchrone, Mike Slattery, Par Carney, Willie Keaveney and Committee Chairman Walter Cox, - in recognition of their sterling work in ensuring that the 125th Anniversary was celebrated in an appropriate manner. Full credit must be attributed to Mr Ollie Mulchrone who recognised the significance of 2014 in the history of Kilmeena GAA and initiated the idea of commemorating the 125th anniversary of the Club. 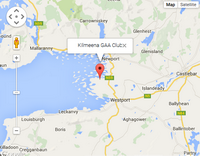 Clew Bay Hotel, Leisure Park Westport, Castlecourt Hotel, Aurivo, Corrib Oil, Johnny Moran’s Bar Bridge street, Toby’s Bar. Your contributions are very much appreciated. Our sincere gratitude to Joe and Ann Corcoran, to Mr Vinny Nugget and all the staff at the Castlecourt Hotel for your professionalism and co-operation with the preparations for our big event. No need for the Brennan Brothers or Nevin Maguire in your Hotel! Thanks to DJ Henry McGlade who provided appropriate music and encouraged those lithe of limb and young at heart to dance ‘til early! Thanks to everyone who worked so hard to ensure the success of this event. This brings the curtain down on our 125 celebrations, in a year that has been memorable by any standards and exceeded our expectations. It is fitting that this last event got such a huge response. 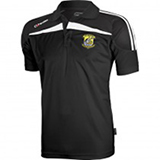 The Club is hugely indebted to the whole community for your continued support. We look forward to the next 25 years, secure in the knowledge that the Club is on solid footing. Walter Cox Chairman of the 125th Anniversary Committee. 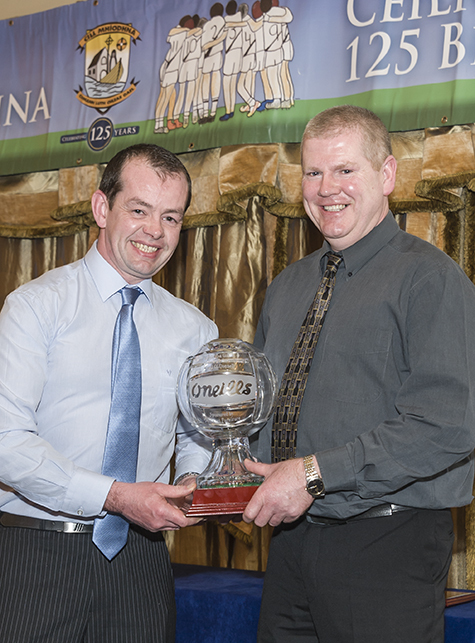 Neil O'Donnell, receives his "CLUBMAN OF THE YEAR" Trophy from Rory Smyth - Mid West Furniture, sponsors of the Award.